Toucans are the symbol of the American tropics and very easy to recognize. 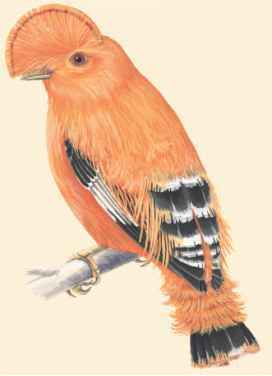 They are large, brightly colored birds with very large bills that are also brightly colored. You are not likely to confuse a toucan with any other bird. A toucan's bill often curves downward at the tip. Though large, it is very lightweight. Serrations along the edge look like teeth. Toucans are distinctive in other ways. They have a long tongue with a brushy tip. The feet have two toes pointing forward and two pointing backward, like a woodpecker's. (Most birds have three toes pointing forward and one toe pointing back). The skin around the eye is bare, without feathers, and often brightly colored. The joint at the base of the tail is unusually flexible. Males and females look much alike, although the male usually is heavier and has a longer bill.